With the demand for titanium aerospace components expected to exceed current manufacturing capacity, it should come as no surprise that interest in titanium machining is rapidly growing among North American manufacturers. However, there are several attributes of titanium that contribute to the challenge of titanium machining conditions, which make profitable titanium part production a balance of both processing speed and maximizing tool life. Heat generation, a natural occurrence within all machining processes, typically disperses through the part material, tool and surrounding environment. Due to titanium’s low thermal conductivity, a higher level of heat is concentrated directly onto the cutting edge of the tool, causing rapid degradation and deformation of the cutting tool. In many cases, tools are worn down so quickly that the cost of tooling alone negates sizable profit margins. Titanium’s high strength and low density are key characteristics for aerospace manufacturers. In terms of tensile strength, titanium towers over other metals with 1100 Mpa, beating aluminum at 69 Mpa and 1020 steel with 350 Mpa. Its low density of 0.16 lb/in3 is nearly half that of 1020 steel (0.284 lb/in3) and just slightly above aluminum (0.097 lb/in3). This combination of high strength and low density makes titanium a valuable asset in the design and construction of modern aircraft. It also has a low modulus of elasticity, or springiness. However, while a benefit in the design of aircraft, this feature contributes to a high level of deflection when stress or force is applied during the process of titanium machining. Compared to steel, which has a similar strength, titanium will produce approximately twice as much deflection, requiring more energy to be input into the cut. The low thermal conductivity of titanium is also a double-edged sword. Although its thermal expansion rate makes it highly compatible with composite materials, titanium is practically an insulator in the world of metals. Normally, when a manufacturer cuts aluminum or steel, 60 percent of the heat generated goes out with the chip. The rest is divided between the workpiece and the tool. With titanium, only 15 percent of heat goes into the chip, and the heat that goes into the chip stays concentrated near to the rake face of the tool. When coupled with titanium’s high strength, manufacturers must apply higher forces, and therefore more energy, into the cutting zone, 90 percent of which is converted directly into heat. This means more heat with nowhere to dissipate but the cutting tool, resulting in rapid tool wear and frequent breakage. In order to properly manage the thermal conditions present in titanium machining, it’s critical to first understand how and why heat is generated in the cutting zone. To do so, calculations can be derived using force models within two distinct areas: the primary deformation zone, where energy is input into the system and material is forced upward, and the secondary deformation zone, which produces frictional heat as the chip curls along the cutter edge. The following series of experiments were conducted at Makino’s titanium research and development facility using a Kistler dynamometer to measure cutting tool forces along the X, Y and Z axes. By mounting a workpiece to the Kistler dynamometer and performing a variety of test cuts, verification of the force model and cutting parameters–surface speed, depth of cut, chip loadâ€”were achieved. This information was then used to generate a ranking of how cutting parameters impact forces in the cutting zone. The first experiment compared cutting tool forces with axial depth cut (figure 1). Adjustments were made to the depth of cut incrementally at 2mm, 4mm, 6mm, 8mm and 10mm. 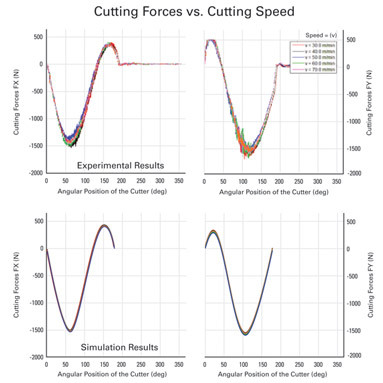 The results revealed a linear relationship between increases in the depth of cut and forces experienced by the tool. In the next case, cutting tool forces were measured against various cutting speeds (figure 2). While there was a measurable difference in forces experienced by the tool as cutting speeds varied, the overall deviation had a minimal impact on the cutting performance. From these findings, an optimal cutting speed of 70 meters per minute was determined. At this speed, heat levels rose to titanium’s softening point of 550 degrees Celsius (1,022 degrees Fahrenheit), reducing the cutting tool forces for improved efficiency. The third experiment evaluated the relationship between cutting tool forces and feed rates (figure 3). 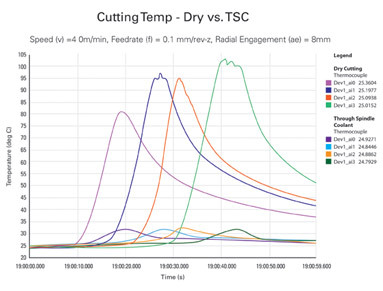 Similar to the test observing axial depth of cut, the cutting tool forces adjusted proportionally to incremental changes in feed rates between 60 microns and 140 microns. By combining results from each test in a Design of Experiment (DOE) study, parameter rankings were revealed: Axial depth and radial engagement had the greatest impact on cutting tool forces, followed by chip load, cooling methods and finally surface speed. It was determined that by reducing radial engagement, a larger axial depth using full flute of a cutter can be used while minimizing the force energy applied to the work zone. Once force rankings are established and a decision is made on how to manage cutting tool forces, focus must then be directed at reducing heat in the cutting zone. This approach requires delicate adjustments to cutting parameters and advanced cooling technologies that not only extend tool life but also improve productivity. Recent cooling tests performed at Makino’s titanium research and development facility used a 3-inch-by-3-inch titanium block fixed with thermal couple sensors to measure and record cutting temperature under a variety of cutting parameters and cooling methodologies. This data was then applied to the inverse heat conduction equation (figure 4) to calculate specific temperatures along the cutting edge. 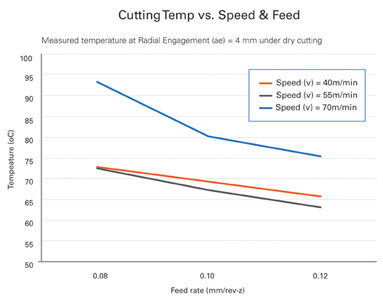 The first round of temperature tests focused on gauging the impact of cutting speeds and feed rates on heat generation (figure 5). Machine processes were established for 40 meters per minute, 55 meters per minute and 70 meters per minute, each with feed rate increments of 80 micron, 100 micron and 120 micron at 4mm radial engagement with a 32mm tool. Thermal couple results indicated that process speeds of 55 meters per minute resulted in the lowest temperatures. As speed increased to 70 meters per minute, temperature rose sharply. A trend in feed rate results was also observed. As feed rates increased from 80 to 120 microns, the temperature consistently decreased across all spindle speeds. Verification of these trends was then tested by adjusting radial engagement to 8mm under the same machining conditions (figure 6). This broke the previously recorded trend with results indicating higher temperatures with increased feed rate. As the feed rate approached 120 microns, strong adhesion and wear on the insert caused higher temperatures outside of the linear relationship experienced in all other cases. A final series of experiments were performed to evaluate the impact of coolant on cutting-zone temperatures (figure 7). Machining parameters were configured with a speed of 40 meters per minute, feed rate of 100 microns and radial engagement of 8mm. Under dry cutting parameters, temperature readings quickly rose from our room temperature of 25 degrees Celsius to 80 degrees, 95 degrees and 100 degrees (or 77 degrees Fahrenheit, 176 degrees, 203 degrees and 212 degrees). This test was then performed using through-spindle coolant. Using this cooling method, temperature readings increased only to 32 degrees, a near 90 percent temperature differential. Based on these results, rankings were established regarding which factors had the greatest impact on cutting temperatures. Above all others, coolant had the greatest effect in temperature experienced at the thermal couple. This finding was followed by surface speed and radial engagement. And while chip load shared a linear relationship with these factors, the magnitude of its impact was much lower. Lastly, axial depth of cut had almost no influence on thermal conditions experienced by the tool. Due to the significance of coolant in thermal control, Makino assessed several common coolant fluids for the highest cooling potential, including water, ammonia, ethanol, liquid carbon dioxide, ethanoic acid and liquid nitrogen. Each fluid was evaluated based on its boiling point and specific latent heat of vaporization. Water had the highest boiling point and specific latent heat, able to decrease temperatures 11 times faster than liquid nitrogen. The insight revealed through this test data can be applied to the titanium machining process through a variety of means: the first and most significant being a machine platform with the power and rigidity for the task at hand. Standard production machining centers typically lack the rigidity, torque and vibration damping technologies necessary to appropriately manage forces that occur during the machining of titanium. As such, a machine platform that’s purpose-built for titanium is highly desired. Coolant technologies must also fit into the overall strategy. According to Makino, best results were achieved by injecting coolant directly between the cutter edge and material at high pressures and high volumes. This approach provides sufficient lubrication to reduce the coefficient of friction and overall production of heat, providing for extended tool life. For more on Makino’s research and development in titanium machining, visit www.TiMachining.com. Figure 1. 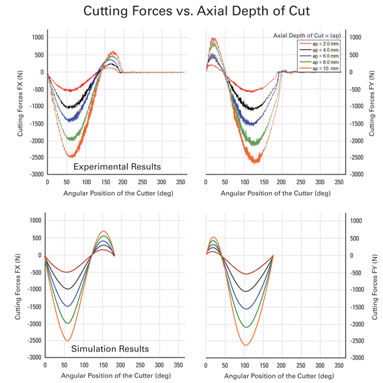 Incremental increases in axial depth of cut revealed a linear relationship with forces experienced by the cutting tool. Figure 2. Changes in spindle speed had a minimal impact on overall cutting forces. Figure 3. 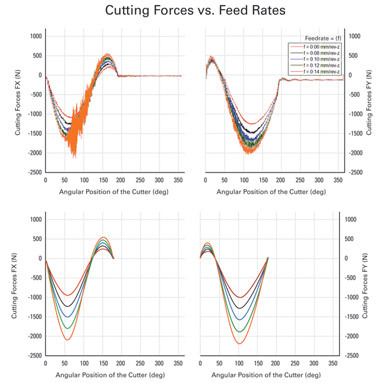 Incremental adjustments to feed rates resulted in proportional changes in cutting forces. Figure 4. The inverse heat conduction equation was applied to calculate specific temperatures along the cutting edge. Figure 5. Evaluations comparing spindle speeds against feed rates indicated lower temperatures at higher feed rates and lower spindle speeds. Figure 6. 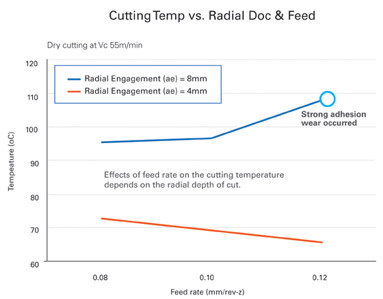 An increase in radial engagement resulted in strong adhesion and wear on the cutter insert, causing higher temperatures than previously recorded. Figure 7. Tests to evaluate the effectiveness of coolant in the titanium work zone revealed a 90 percent temperature differential between processes with and without coolant.